Scott, Julie Mcganney, Patrick Cory, Pat Todd, Patricia Choloski, Kim Butcher, Annelise Lynch, and Brenda Browning. 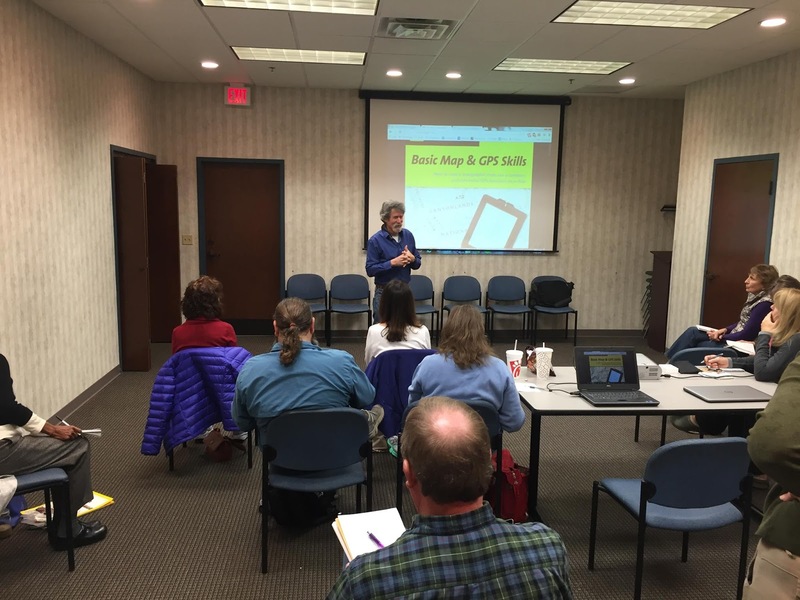 A class of 12 students met at the Greene County Library on Saturday, January 16, 2016 to work on their navigational skills using both map and compass and smartphone GPS apps under the tutelage of Mark Perschel and Jeff Monroe. 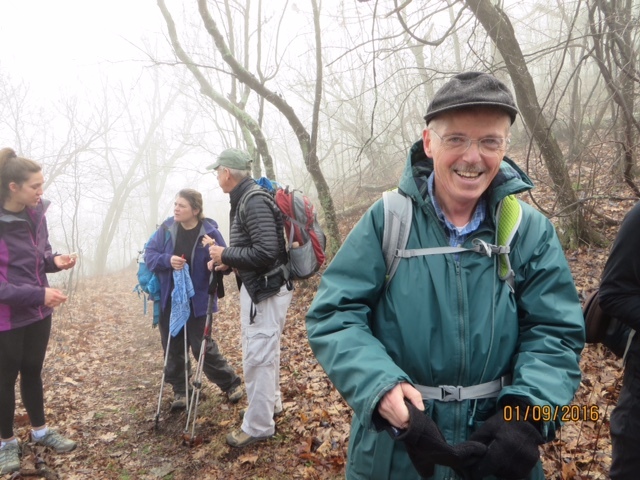 Mark has completed the legendary hiking “Triple Crown,” having hiked all of the Appalachian Trail, Pacific Crest Trail, and Continental Divide Trail. He believes that the skills he taught the group have saved his life on the trail. Students included Iva Gillet, Nancy Weiss, Carol Wise, Susanna Williams, Lorna Werntz, Barbara Martin, Emerald Young, Geoff Manning-Smith, Paul Embry, Katherine Quartuccio, Tony Lagana, and CJ Woodburn. Mark recommended the Gaia app for iPhones and the Backcountry Navigator app for Android phones. The class started out going over basic map and compass skills, using a publication by National Geographic found online. The class progressed to cell phone GPS apps and looked at Youtube videos easily found by searching that site. Jeff advised folks to use Youtube extensively to learn these skills, as there are a lot of great videos online that anyone can watch multiple times. You cannot connect with the concepts completely with only a single viewing. The group went out to a local park and after lunch and beers supplied by Mark, went out searching for plastic eggs set out around the park and waypoints in their phones. The group used both compasses and cell phones to locate these items with a minimum of battery use, mirroring conditions on the trail. The class was urged to keep playing with these apps until they become second nature and to go out and teach others these concepts – this knowledge can save a life! Our first hike of 2016 was a glorious, well attended 5 mile loop to White Rocks Falls off the Blue Ridge Parkway. 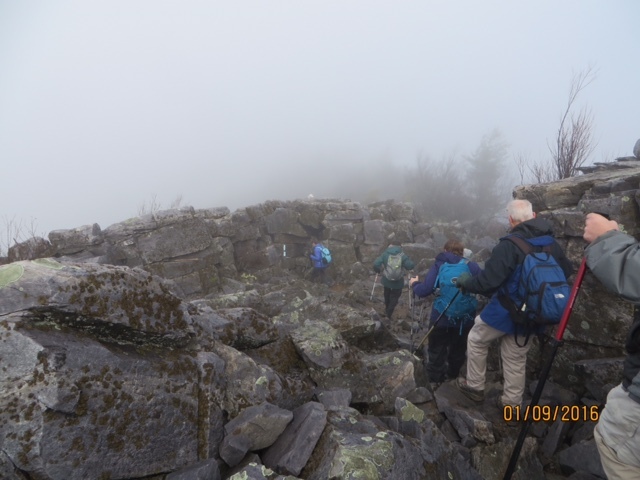 While most hikers met at AHS; CJ Woodburn, David Crowe, Michael Seth, Ginny Barber and Nancy Handley were jumping up and down to stay warm when we arrived... it wascold and windy! We did not linger but headed off for the woods to keep warm. Brian Muszynski led the pack of 22, Bill Holman brought up the back as sweep as we headed down the Slacks Trail. 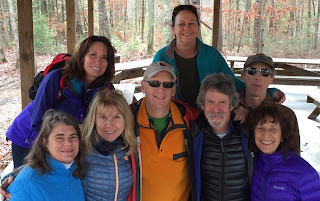 We were glad to have Edna Baden, retired PATC staff director, Carol Wise, Virginia Masterson, Katherine Maus, Lee Wenzler, Debbie Wilson, Brenda Browning, and Cat McCue joining our frequent hikers Debra Fisher, Jodi Fredrickson, Dave Abdullah, Ben and Pete Fink, and Marian Styles. As we descended, the wind decreased and we stopped to take off some layers. Bill confirmed that we had lost no one (yet). 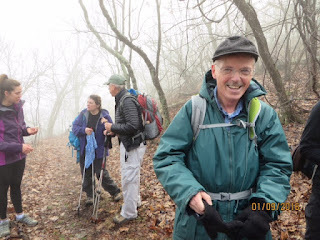 We convened again before crossing the Blue Ridge Parkway, at which point our sweep Bill had decided he had had enough and hiked on the Blue Ridge Parkway back to the start. Continuing to descend, we noticed the water in the stream was impressive, thanks to recent rains. When Iva, now sweep, caught up with the group she found several folks, including Michael Seth, taking an early lunch break. But with a crack of the verbal whip, we mushed on up the climb toward the falls. Michael and Pete chose a lunch spot below the falls, and we spread out over the many rocks and limbs for lunch. We shared our food and conversation. Afterward, we continued our climb, taking the right turn to the base of the falls. The water was more plentiful than usual and with the sun shining brightly, it was a peaceful, mossy spot where Brian performed his yoga poses. After a brief respite, we completed the climb and straggled back to the cars. As it was only 2 PM, some dashed off for other activities, while several of us headed to Devil’s Backbone for some refreshment. While it was chilly, the sunshine and picnic tables provided a wonderful spot for further comradely before heading back. It was a perfect hike to start the new year! 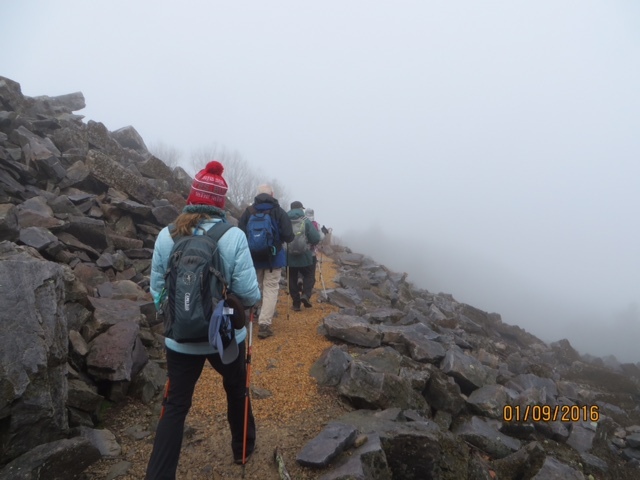 A group of 4 Charlottesville-based hikers and 2 Roanoke Appalachian Trail Club members met at the legendary A.T. Foot Bridge parking lot to take on a loop hike that included the Saddle Gap Trail, the Appalachian Trail, and the Salt Log Gap Trail. The crowd hiked through the clouds and intermittent rains, which limited views. 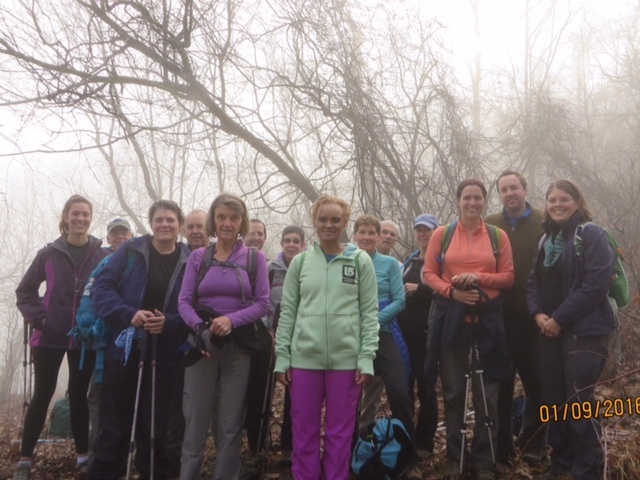 The group still had a great time hiking these seldom used trails. Hikers from Charlottesville included Marion Styles, Susanna Williams, John Brandt, and hike leader Jeff Monroe. 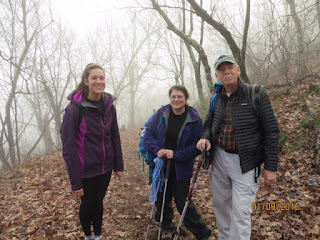 Iva Gillet, with dog Remi, and Bill Holman led and swept this 4 mile loop in the shadows of Humpback Rock. Meeting at AHS were Bev and Pete Fink, Marian Styles, Cat McCue and her dog Josie, Emerald Young, Neil McKinney, Debra Fisher, Andy Willgruber, Brianna Taylor and Baby ?, Samara Khalique, and Brian Muszynski. Andy and Brianna shared the wonderful news of their marriage AND that they are expecting a baby boy in April! Andy is pleased that in a decade or so, there will be another young AT trail maintainer in the group. We arrived at Humpback prior to the parking lot getting too crowded meeting Carol Wise, Mary Buford and Fred Hitz and their dog Peachie, Ginny Barber and Bill Westen at the trail head. We began our loop down the Old Howardsville Turnpike, turning north on the AT, then heading to the Glass Hollow overlook. Then trail was full of Boy Scout groups, and they fled the overlook when Brian arrived. We enjoyed a snack/ early lunch including Blondie bars at this awesome vantage point into the Rockfish Valley. Perfect temperature and lots of sunshine, so we did not rush off. We proceeded along the AT until turning onto the Albright Loop Trail and easily spotted the plane wreckage. Climbing Dobie Mountain we stopped periodically to admire the view and catch our breath. 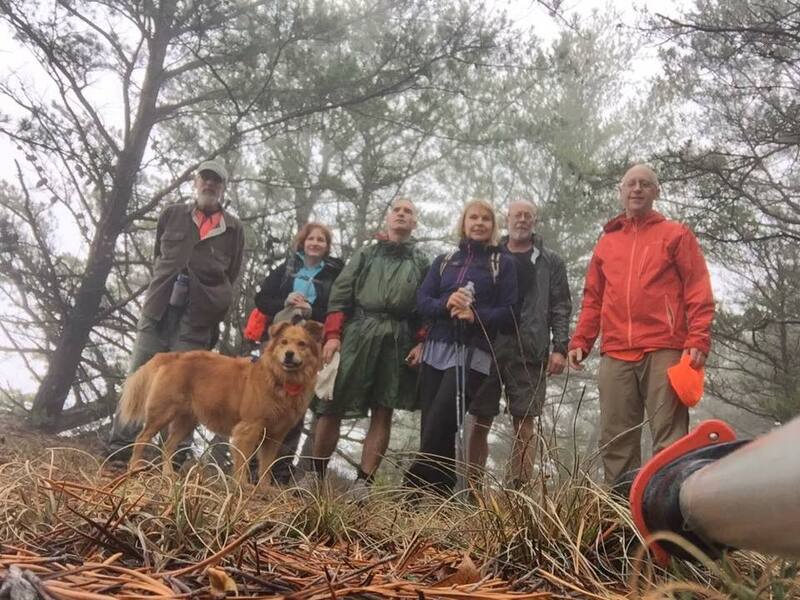 Lots of good conversations with new hikers (Mary Buford, Fred, Bill, Carol, and Cat) and some faces we haven’t seen in a while. 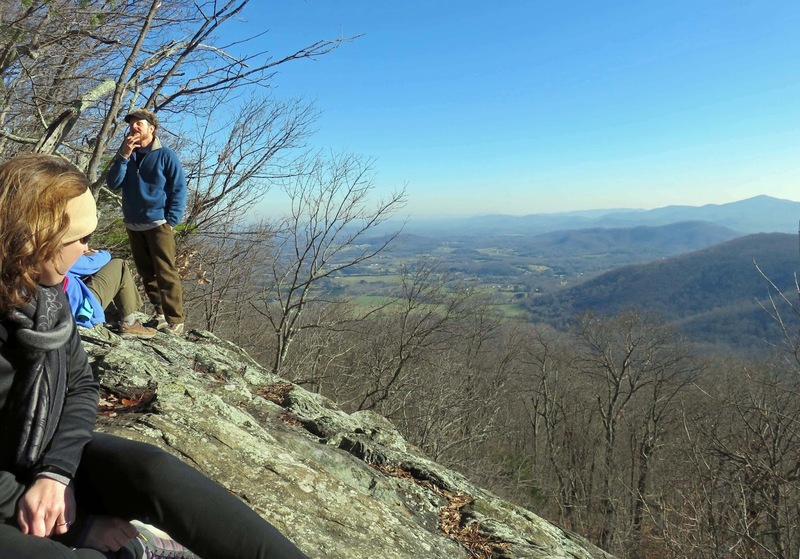 We were also thrilled to have our youngest hiker (in vitro) and 3 dogs!